A team of Chinese and American scientists has discovered a new mammal from the 165 million-year-old lakebeds of the Jurassic Period in Northern China. The find is reported in the November 1st issue of the journal Nature. It sheds light on the earliest mammalian evolution, especially the convergent evolution of teeth among early mammals, and leads scientists to think that mammals were far more diverse in the age of dinosaurs than previously thought. "This discovery indicates that Jurassic mammals had achieved far more complex dentition than believed, suggesting that mammals diversified much more rapidly in their early evolution than was known," said Richard Lane, program director in the National Science Foundation (NSF)'s division of earth sciences, which funded the research. The new mammal, named Pseudotribos robustus, was an insectivore feeding on worms and insects. Its skeleton is about 12 centimeters long, and its estimated weight would be about 20 to 30 grams. This small animal had strong limbs and lived on the ground but was also capable of "power digging." The fossil was discovered in 2004 in the Ningcheng County of Inner Mongolia Region of China and is now deposited in the Institute of Geology, Chinese Academy of Geological Sciences in Beijing. Mammals have very diverse teeth, scientists have found, and groups of mammals are distinguished by their teeth. Giraffes and zebras are plant eaters, cats eat meat, aardvarks feed on termites, and many primates prefer fruits. Modern mammals are all descendants from ancient mammals--living with the dinosaurs in the Mesozoic--with tribosphenic teeth ("sphen" is Greek for shearing and cutting; "tribo" is Greek for grinding and pounding. The "tribo-sphenic" molars have both a cutter and a grinder.). The new mammal has "pseudo-tribosphenic" teeth. 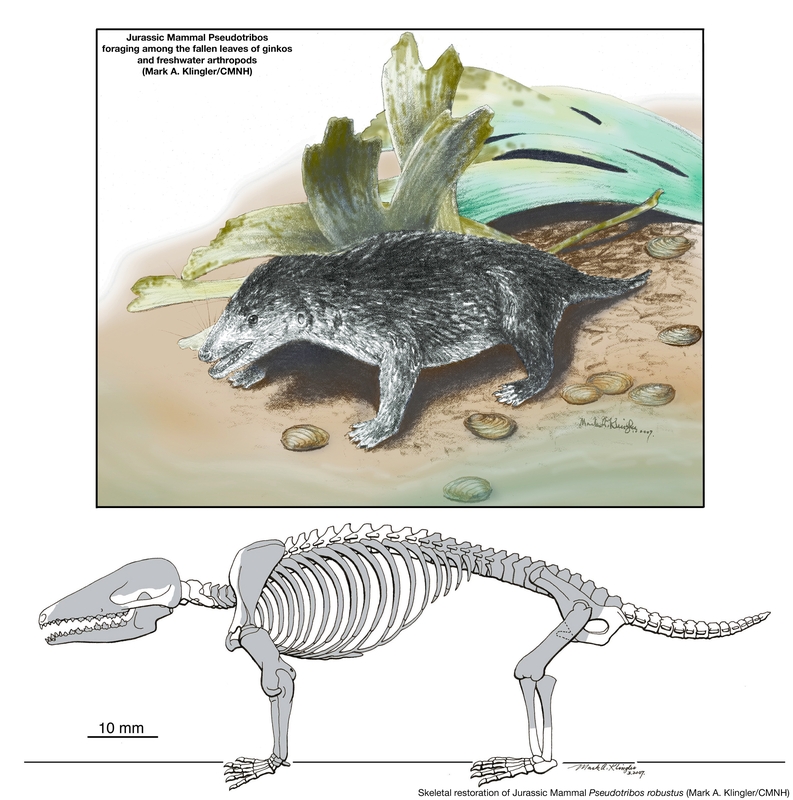 The earliest marsupial and placental mammals and their kin all had tribosphenic teeth capable not only of cutting, but also grinding. The combined shearing and grinding tooth structure made more versatile feeding functions possible, and are therefore important for early mammalian diversification. The pseudo-tribo-sphenic mammal teeth are superficially similar to the tribo-sphenic teeth in having a cutter and a grinder, however, the cutter and grinder are arranged in just the opposite positions. Zhe-Xi Luo, a paleontologist at the Carnegie Museum of Natural History and a member of the international team that made the discovery, said that "in the pseudo-tribo-sphenic, the grinder is in front of the cutter; in the true tribo-sphenic teeth of the ancestors of marsupials and placentals, the cutter is in front of the grinder. The story of the earliest mammals is a story of their teeth. By tracing their evolution in the rich fossil record of the Mesozoic, we can understand how these cutting and grinding teeth evolved over and over again." Because tribosphenic teeth are such a unique and intricate structure, paleontologists once believed that there must have been a single origin in the Mesozoic. However, the pseudo-tribosphenic molars from the new fossil shows that similar structures to combine cutting and grinding had evolved several times. Under natural selection, organisms descending from different ancestors can evolve analogous structures and similar adaptations, a phenomenon known as convergent evolution. "The pseudo-tribosphenic teeth and the true tribosphenic teeth are great examples of convergent evolution and a great manifestation of how dental and feeding adaptation can be achieved by different lineages of mammals," said Luo. With their versatile functions for chewing different kinds of food, the tribosphenic and pseudo-tribosphenic teeth are key evolutionary innovations that enabled some of the earliest mammals to diversify in the Mesozoic times. They are considered by many paleontologists to be more advanced than primitive mammal teeth that were limited to cutting, not grinding or crushing.